Each person lives with their own impediments. Perhaps our vision doesn’t look beyond our own noses. Maybe we are deaf to the calls of those in need. with clear vision and compassionate listening. of justice in an unjust world. Trust our good God to heal your impediments. Be opened. Why were the people in today’s Gospel so deaf and blind to Jesus’ true identity and message? What am I not seeing that Jesus wants me to see more clearly? What am I not hearing that he wants me to hear? Which of my impediments do I most need to be opened? This really hit my head and my heart today. letting you know sooner or each week what a grace your writing can be. I had to laugh to myself when I read your poem today. On my way into work I was thinking about how Jesus healed the blind man. Then I checked my emails at work. When I saw there was a prayer poem waiting I prayed “open my eyes and heart Lord”. The first word I read was “openess”. Hmmm, think it’s a hint? Thank you thank you thank you! Just read your prayer poem. Made me think of the saying (not sure who said it) – We see things not as they are but as we are. Thanks for your reflection. 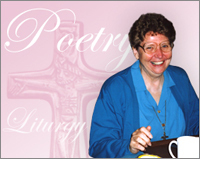 Dear Mary Anne, I am very happy that the gospel poetry is affecting the readers. Thanks for letting me know. Val, isn’t it great the way the Holy Spirit works in our lives! Dion, I think it was Steve Wirth. Thanks for the additional thought. May the Holy Spirit continue to open layer by layer the blindness not only of our eyes, but our hearts, too.